FORT RUCKER, Ala. -- Fort Rucker firefighters lent helping hands, along with a view from above, to help contain a blaze that threatened an entire town. 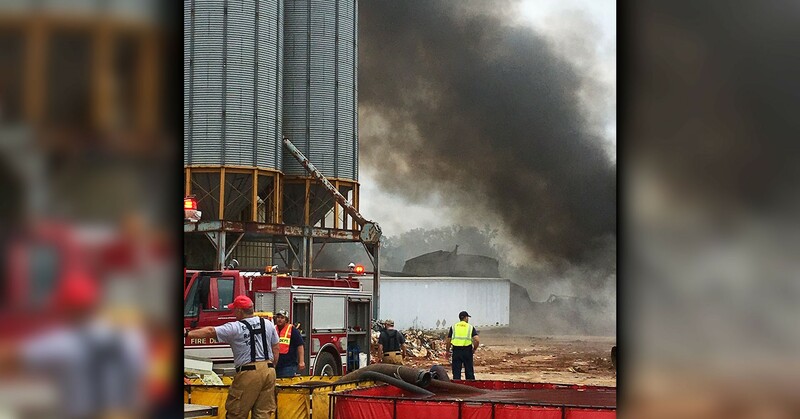 On March 25 around 9:30 a.m., the Fort Rucker Fire Department received a call requesting aerial assistance for a fire that was raging at a recycling facility in downtown Brantley in Crenshaw County, said Shane Brown, Fort Rucker assistant fire chief. "We received the call … that the recycling center downtown was on fire and it was threatening to spread to other buildings (in the area), so they requested assistance with aerial support, which would be our ladder truck," said the assistant fire chief. 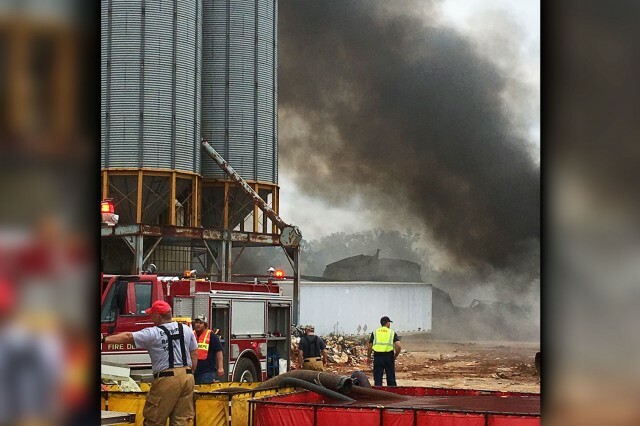 Of the 10-acre complex, the fire had engulfed about 5 acres, which included multiple buildings and 800,000 pounds of materials, such as plastics, tires and other recycled materials, according to an email by Jessica Schweiger, Alabama Emergency Management Agency Division B coordinator. The fire caused a partial evacuation of the town because of the toxic smoke given off by the blaze. "The initial request was for aerial support because they did not have a ladder truck big enough to reach the areas to put large amounts of water on the fire they had," said Brown. "When we arrived on scene, we made contact with the command post to see what they needed from us, and they wanted us to see what it looked like from the air, so we deployed the ladder, checked it out and filled in as manpower." Brown said that Fort Rucker was ready to aid in any way possible, especially considering those on sight had been battling the blaze for more than five hours by the time they arrived. "Those ladies and gentlemen had been doing an outstanding job, but they had been going at it since about 5:30 that morning, and by the time we got there it was 10:30 -- they were pretty worn out," he said. "We were able to go in there and give them a break." The Fort Rucker Fire Department was able to assist in efforts to contain the fire, but by about 1:30 p.m., the Alabama Department of Environmental Management stepped in, concerned about toxic runoff water that could potentially get into the town's water supply, and halted extinguishing efforts. "At that point we took a defensive operation, and in the event that the fire spread we would engage, but we stopped all tactics at that time," said Brown. "Sometimes it's safer to let a fire burn itself out because it consumes the (fuel) for the fire and doesn't let it spread further," added Jay Evett, Fort Rucker fire chief. With the joint effort of multiple agencies, the fire was able to be contained to prevent it from spreading to adjacent buildings in the downtown area, said Brown. The support that Fort Rucker was able to provide is just part of mutual aid agreements the installation has with its surrounding communities, said Evett. "We try to assist in any way that we can," said the fire chief. "We try to do as much as possible and try to be good community partners." "We have resources available to offer to outside agencies and we train hand-in-hand with these agencies -- they come to us and we go to them," added Brown. "A fire is the same whether it's here on post or if it's off post -- we're all one big team and that's what we're here for. They didn't hesitate to call and we didn't hesitate to go help." That help was appreciated by the different agencies involved, said Schweiger in her email. "I have always known what an asset the installation is to the area," read the email. "The equipment and manpower that you all were able to provide was invaluable when it came to the suppression and containment of this fire."